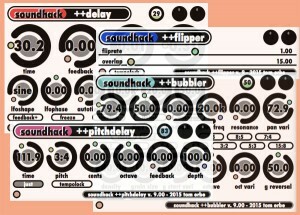 SoundHack Delay Bundle is a group of four plugins derived from the same basic delay algorithm: a hermite interpolated delay line with variable modulation, and a feedback loop with dc blocking and saturation. Pitch shifting is achieved with a dual head crossfading delay (ala Eltro Tempophon/Dennis Gabor/Pierre Schaeffer phonogene) and is decidedly retro. The saturating feedback also allows them to be great drone and noise generators. 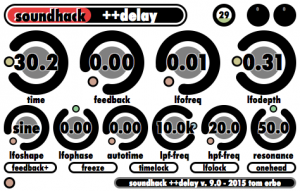 +delay gives you classic delay effects, with a wide ranging filter section to help emulate vintage delays, an LFO time modulator with triangle, sine, ramp, square and random waveforms, as well as freeze mode, dual-head mode and feedback inversion. Both the delay time and the LFO modulator can be synced to multiples and divisions of the host clock. 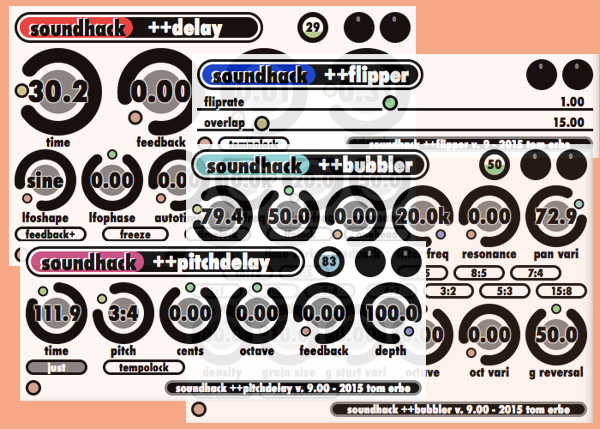 +pitchdelay, is based on the same codebase as +delay, but the controls are oriented toward pitch shifting, giving you classic rotating head pitch shifting. Pitch can be adjusted in equal tempered semitones or just ratios with additional cents and octave controls. The time and depth controls can radically alter the quality of the pitch shifting, from subtle to comical. 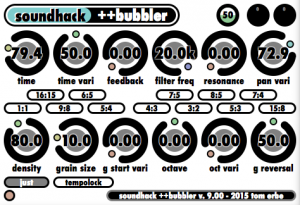 +bubbler is a granular delay in which grains are pulled from the delay line with randomized start time, delay time, reversal, panning and pitch shift values. As pitch shift can be distributed to multiple simultaneous grains, chords can be played with the on screen buttons, or by sending MIDI to the plugin. +bubbler uses 8 channels of grains which can give you an extremely dense cloud of sound. Good for creating ambient chordal washes from simple material. +flipper is a simple sound reverser. It records sound into a delay line and after a little bit starts to play it back backwards. This plugin is somewhat hard to control, but works best when tempo locked to the host clock. 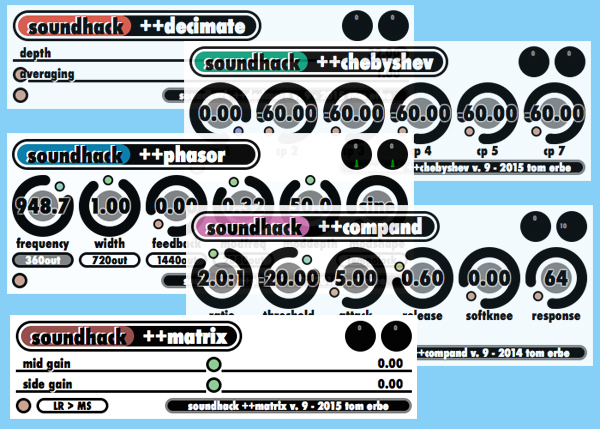 The Freesound bundle is a collection of VST/AAX/AU, Mac/Windows plugins that I have developed while teaching music programming at UCSD and CalArts. ++chebyshev A distortion unit which uses several low-order chebyshev polynomials to add even or odd harmonic distortion. This can be used to make a sound gently saturated (3rd chebyshev polynomial), harshly distorted (7th chebyshev polynomial) or like a dying amplifier (2nd or 4th chebyshev polynomials). 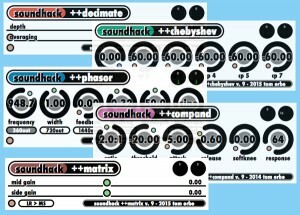 ++compand is a combined compressor/expander plugin. It has a softknee control as well as a switchable rms/peak level detector. it also has a variable width level detection window (response). ++decimate uses bit depth and sample rate reduction for added aliasing and decimation noise. a very noisy plugin. useful for adding harshness, distortion and brightness to any sound. ++matrix is a mid-side to left-right encoder and decoder. for mid-side microphone arrays, but also useful when needing to apply effects to only the center or the sides of a stereo mix. ++phasor is a multistage phase shifter that has outputs for 360, 720, 1140 and 2880 phase shifting (1, 2, 4 and 8 notch). bandwidth, central frequency, feedback, and modulator parameters can be adjusted.